What might have happened if SCE&G and South Carolina's political leadership had invested in energy efficiency, rather than the V.C. Summer nuclear plant? Will they now heed the lesson and embrace efficiency, the proven least-cost energy resource? The following is the first in a series of posts taking an in-depth look into the energy efficiency achievements a missed opportunities for Southeastern states and utilities from SACE’s recently published Energy Efficiency in the Southeast 2018 Annual Report. To view the full report, click here. Stay tuned for upcoming posts focused on North Carolina, Georgia and Florida Power & Light. The Post & Courier, among others, have reported extensively on how South Carolina Electric & Gas‘s gamble on the V.C. Summer nuclear power plant was a complete bust that led to major rate hikes for customers and a devastating financial hit for the utility. What hasn’t been reported is how this financial nightmare also negatively impacted SCE&G’s investment decisions in the lowest-cost energy resource: energy efficiency. So what might have happened if SCE&G and South Carolina’s political leadership had taken a different path … one that prioritized energy efficiency resources to eliminate energy waste, reduce customer bills, and offset the need for new power generation? More importantly, will the next step for SCE&G include a significant investment in energy efficiency, or will customers again be on the hook for more expensive energy infrastructure? In 2008, SCE&G hired a consultant to guide future energy efficiency investments. By 2012, SCE&G was capturing annual savings of 0.5%, which at the time was just behind the Southeast regional leader, Duke Energy. The plan was for SCE&G to continue ahead to 0.8%, but instead the next three years saw a significant downward slide. 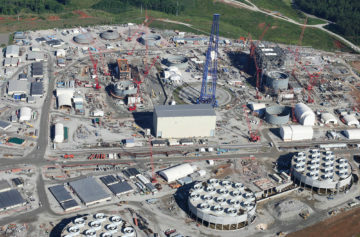 Also in 2008, SCE&G applied to the Nuclear Regulatory Commission to build V.C. Summer Units 2 & 3. After repeated delays, billions of dollars in project cost overruns, and bankruptcy of the construction contractor, the project was finally cancelled in 2017. As a result, South Carolina’s families and businesses are on the hook to pay for much of this unfortunate boondoggle. As another side effect of V.C. Summer’s costs spiraling out of control, SCE&G’s energy efficiency programs were defunded, falling to half of their 2012 levels before rebounding slightly in 2017 (see graph). When headed down the wrong road, one bad decision led to another. Entergy Arkansas, another regional leader, shows what SCE&G might have achieved if it had prioritized saving energy rather than building a large and risky central station power plant. Between 2012 and 2017, Entergy Arkansas ramped up their energy efficiency savings from 0.25% to 1.49% of annual sales, during the same time period that SCE&G went in the opposite direction, from 0.5% in 2012 to 0.25% in 2017. By 2017, average bills for SCE&G residential customers were 33% higher, and residential rates were up to 15 cents/kWh, compared to Entergy Arkansas’ 10 cents/kWh. The Arkansas experience clearly shows that it is possible to substantially lower energy bills with investments in energy efficiency while also maintaining competitive energy rates. SCE&G’s experience, on the other hand, shows what happens when a utility heads down the wrong road, then continues all the way until they reach the bottom. In the aftermath of V.C. Summer, there is a new fork in the road. So where is SCE&G heading now? Will the utility and public officials heed the lessons of V.C. Summer and fully embrace low cost modern energy efficiency and renewable energy? Efficiency has no variable fuel costs, can be added incrementally as needed, and can be deployed to solve targeted load serving needs, such as eliminating peaking power in the most expensive summer and winter months. OR: Will the utility instead fall back into the trap of constructing large centralized fossil fuel infrastructure, with legislators again turning a blind eye? In light of recent experience, before any action is taken to build or acquire new gas plants (one is currently planned for service in 2023), shouldn’t we expect to see alternative plans built on robust energy efficiency and renewable energy strategies first? On encouraging sign is that SCE&G has recently hired a consultant to develop a new plan for ramping up energy efficiency — the report is expected soon. The opportunities for low cost energy efficiency abound in South Carolina. Yet, historic policies have favored expensive central power plants over the savings and flexibility provided by energy efficiency. Utility planning and state policy must change, and must prioritize a new set of energy options. The new plans and policy must put customers first, lest South Carolinians be subjected to the mistakes of the past all over again.